Identical to MRPT_DECLARE_TTYPENAME but intended for user code. MUST be placed at the GLOBAL namespace. Definition at line 57 of file TTypeName.h. Definition at line 60 of file TTypeName.h. 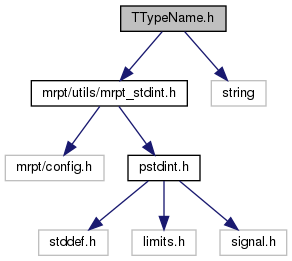 Definition at line 64 of file TTypeName.h. Definition at line 68 of file TTypeName.h. Definition at line 72 of file TTypeName.h.